In Chinese, a single-edged blade is called dao – knife (刀), no matter how big or small. So da dao means big dao. A double-edged sword that is straight is called jian (劍). During the Japanese invasion, the Chinese troops, even the Republican forces, were decades behind the Japanese in armament. For that reason, it was estimated that a unit of Japanese force has somewhere between 4 to 10 times the fighting capability of its Chinese counterparts. However, it was discovered during the battle that the da dao was a very useful close-in fighting weapon, superior to the fixed bayonet (as evident after 29th Army‘s famous victories). A postcard made by a WWII Japanese NGO showing their dreaded opponent The Big Sword Unit of 29th Army guarding the Tianjin Railroad Station during retreat of Nationalist Army. Throughout the war the civilians have been donating for the war effort. At the time China had a very primitive industrial base (we couldn’t even manufacture matches in bulk – the old name for matches are called yang huo – foreign fire, because they were all imported), we couldn’t manufacture any modern weapons in bulk. That would require high degree of manufacturing infrastructure, as well as all the sophistication implied, like standardization (interchangeable parts), which required high degree of precision and uniformity. By comparison, the da dao is an very primitive weapon in design and construction. Just about any neighborhood blacksmith can make it. If it’s off by an inch or two, so what? And for the material, even if it’s not the best steel, it’s no big deal. It’s bulk usually guarantees it will have the required sturdiness. This is why there are so many variants of these swords. So donating money to have da dao’s made was very popular, even in the cities. Many Tonbei Quan masters were involved in training the troops. My teacher talked to some of them during the 70’s and 80’s. According to those masters, the techniques they devised and taught to the general troops where no more than 10. In fact most of the time only one technique was used – a powerful upward sweep to knock (磕) the incoming bayonette away, and at the top, reverse course for a powerful cut (砍) downward toward the neck. So effective were these simple weapons and techniques, the Japanese military actually devised a neck protector – a folding metal collar that is attached to the helmet. But it proved to be too weak for practical usage. Since the da dao weighed 4-5 pounds, when swung, it has more than enough momentum to knock away a thrusting rifle bayonet. In Chinese martial art we say “a 1 once weight when swung generate a 10 pound force”. Historians note that in European history, most single-handed weapons, like the axe, weighed only 3-5 pounds. The number and type of techniques taught in this case conforms to what we know about martial art techniques for the battlefield in general: when it comes to the average soldiers, only those that are simple to teach, simple to learn, and simple to use are suitable. An iconic image of the era: units that specialized in close quarter combat usually paired da dao with Mauser C96 pistol. 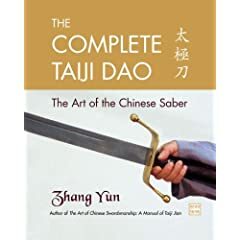 This and other historical information about dao in Chinese martial art are discussed in more detail in Zhang Yun‘s new book The Complete Taiji Dao: The Art of the Chinese Saber.